With a stay at Jägerhof Kettwig in Essen, you'll be 5.4 mi (8.7 km) from Villa Hugel and 13.5 mi (21.8 km) from CentrO. Featured amenities include complimentary newspapers in the lobby, luggage storage, and laundry facilities. Free self parking is available onsite. With a stay at Pension am Kurbad in Bad Freienwalde, you'll be 7.1 mi (11.4 km) from Schorfheide-Chorin Biosphere and 10.7 mi (17.2 km) from Barnim Nature Park. 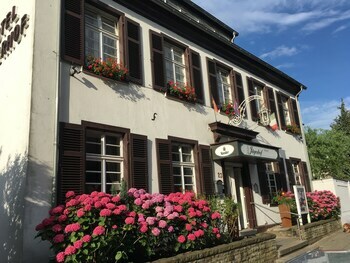 Located in Wernigerode, Aparthotel Villa Ratskopf Wernigerode is a 5-minute drive from Museum of Aviation and Technology and 6 minutes from Buergerpark. Free self parking is available onsite. With a stay at Zum Goldenen Rössle in Triberg im Schwarzwald, you'll be within a 15-minute drive of Ortenau and Triberg Waterfall. Free self parking is available onsite. When you stay at Akademiehotel Jena in Jena, you'll be 7 minutes by car from Zeiss Planetarium. Featured amenities include luggage storage and an elevator (lift).